Buddhists are one of the least understood religions out there, not because of a disinterest in understanding it, but because of so much disinformation. Buddhist jokes actually help us understand Buddhism the way it should be. These are a few of my favorites. 1. Says the Master to his pupil: "Do you understand that you don't really exist?" 2. A zen student asked his master: "Is it okay to use email?" "Yes", replied the master, "but with no attachments." 3. Someone sent the Buddha a gift box tied with a ribbon. Buddha opened it to find it empty. "Aha! ", he said, "Just what I wanted. Nothing!" "I know you're out there. I can concentrate on your breathing." 5. A Western Buddhist woman was in India, studying with her teacher. She was riding with another woman friend in a rickshaw, when they were attacked by a man on the street. In the end, the attacker only succeeded in frightening the women, but the Buddhist woman was quite upset by the event and told her teacher. She asked him what she should have done: "what would have been the appropriate, Buddhist response?" The teacher said very simply, "You should have very mindfully and with great compassion whacked the attacker over the head with your umbrella." Make me one with everything. The pizza chef prepares it and gives it to the monk. The monk pays him and asks for the change. The pizza vendor says: "Change comes from within." He kept marking the cause of death as "birth." 11. A Buddhist phones the monastery and asks the monk, "Can you come to do a blessing for my new house?" The monk replies "Sorry, I'm busy." "I'm doing nothing." replied the monk. "Doing nothing is a monk's core business and you can't help me with that." So the next day the Buddhist phones again, "Can you please come to my house for a blessing?" "Sorry," said the monk, "I'm busy." "I'm doing nothing," replied the monk. "But that was what you were doing yesterday!" said the Buddhist. "Correct", replied the monk, "I'm not finished yet!" 12. Prince Gautama, who had become Buddha, saw one of his followers meditating under a tree at the edge of the Ganges River. Upon inquiring why he was meditating, his follower stated he was attempting to become so enlightened he could cross the river unaided. Buddha gave him a few pennies and said: "Why don't you seek passage with that boatman. It is much easier." 13. 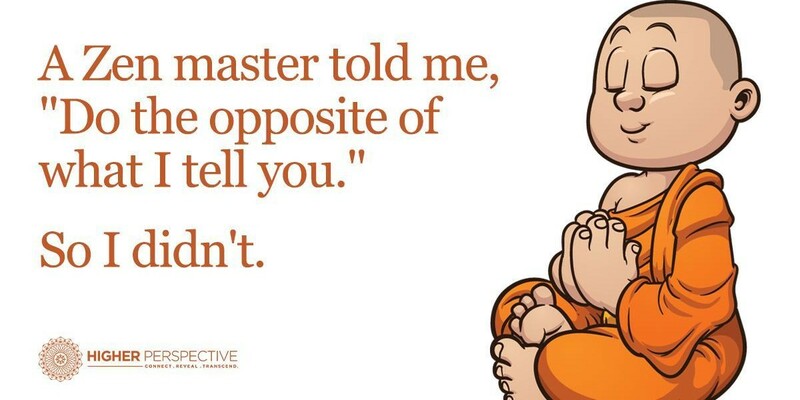 A Zen master told me, "Do the opposite of what I tell you." So I didn't.